Bucerotiformes is an order that contains the hornbills, hoopoe and wood hoopoes. Sometimes classified as members of Coraciiformes although increasing amount of evidence seem to support these birds being distinctive enough to warrant their own order. Recent genetic data show that ground hornbills and Bycanistes form a clade outside the rest of the hornbill lineage. 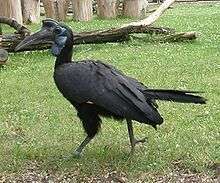 They are thought to represent an early African lineage, while the rest of Bucerotiformes evolved in Asia. The hoopoe subspecies Saint Helena hoopoe and the Madagascar subspecies are sometimes elevated to a full species. The two wood hoopoe genera, Phoeniculus and Rhinopomastus, appear to have diverged about 10 million years ago, so some systematists treat them as separate subfamilies or even separate families. ↑ Johansson, Ulf S.; Ericson, Per G.P. (2003). "Molecular support for a sister group relationship between Pici and Galbulae (Piciformes sensu Wetmore 1960)" (PDF). J. Avian Biol. 34 (2): 185–197. doi:10.1034/j.1600-048X.2003.03103.x. Retrieved 2008-10-30. ↑ Woodruff, D. S. & Srikwan, S. 2011. Molecular genetics and the conservation of hornbills in fragmented landscapes. In Poonswad, P. (ed) The Asian Hornbills: Ecology and Conservation. National Center for Genetic Engineering and Biotechnology, Bangkok, pp. 257-264.